Access to publicly shared space and accommodation of cultural diversity in public spaces pose challenges for urban planning and management in multicultural cities with an experience of violent inter-ethnic conflict. Responses to these challenges require an understanding of the mechanisms that facilitate integration at a city level and improve social interaction between ethnic groups. Ethnic diversity and cultural heterogeneity are a reality for the city of Skopje, the capital of Macedonia. The changing ethnic demography and redressed power-balance between majority and non-majority groups on a local level have spurred a turbulent conflict – that of governance of diversity in public space. Therefore, it is imperative to investigate under which conditions cultural diversity in multicultural cities and neighbourhoods can affect the lives of the residents, and with what impact. In the Macedonian context of recognising diversity, the popular belief of politicians, academics or ordinary people is that accommodation of diversity in public space implies to the right of the majority group and that the ethnic identity of its members be visually represented in the territory they occupy. Symbols of a group`s ethnic history and cultural memory facilitate recognition and identification with space, which recreates it as an ethnic space. The new cultural nationalism capitalised in the project Skopje 2014 installed mono-ethnic narratives in public spaces and removed the “dangerous” memories of the Other, reducing the role of citizens as mere spectators of how spaces, communities and the city are created. 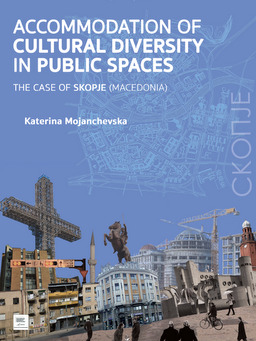 Hence, this research aims to understand how citizens of the city of Skopje perceive the practices of accommodation of cultural diversity in public spaces. In particular, it aims to understand citizens’ views on how language, ethnicity, religion and collective cultural symbols are legitimised through the physical form and the political, social and symbolic (cultural) value of public spaces in their neighbourhoods.